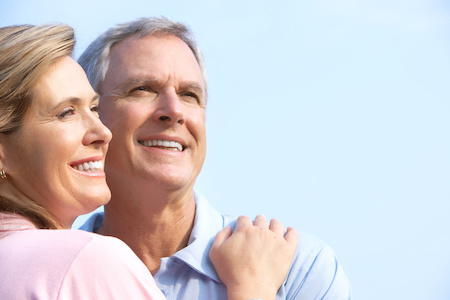 When you’re replacing your missing teeth with dental implants, you want your new smile to look and feel natural. Our certified prosthodontist is an expert at full mouth reconstruction and designing custom restorations like implant crowns and bridges. To get it just right, we typically create a diagnostic wax up to see how your new smile will look before we even start your treatment. That way you know exactly what your implant crowns or bridges will look like before the permanent ones are even ready to bond into place. To replace a single missing tooth – we use an independent implant anchored into the bone, and place an abutment on top of it. Then, a porcelain crown is affixed over the abutment so that it functions as a stand-alone tooth. Our custom porcelain crowns with an abutment are starting at $850 each. It comes out to a total of $2,600* from start to finish for each single tooth implant procedure. 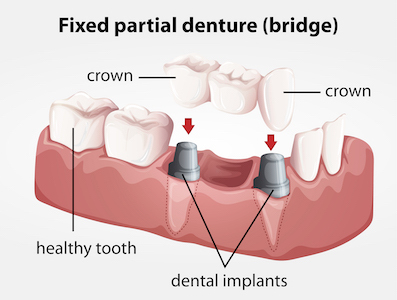 A bridge is similar to several crowns fused side by side, supported on each end by dental implants. Bridges span the length of areas of missing teeth, correcting aesthetic issues and restoring natural chewing function. Otherwise, a collapse of the bite can occur, due to shifting of the teeth. Depending on the number of missing teeth that are present, a bridge can be supported by as few as just two implants, which cost $1,200 each. Whether you need to replace one or two teeth – or you’re looking into a hybrid implant-supported denture, Dental Implant Solutionz in Largo can help! We’re more affordable than most Florida implant centers, so there’s no need to travel across state lines or go overseas for your dental work. Plus, we’ll even show you how to file your own insurance claims, so that you spend little to no money on your implant procedure. Call us to find out how! Our new patient special is just $59 and includes an exam, comprehensive x-rays, and a healthy smile cleaning. CareCredit Financing is also available.